Cats slot has a bit of everything you could want from a wagering game; Big wild animals, great sound effects and some big wins in both the normal game and the bonus round. 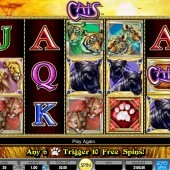 Cats is one of the only slots that has split symbols on some of the blocks giving you a chance to win up to 10-of-a-kind. I have played Cats on numerous trips to Vegas and Reno, but you can find it all over the place including Europe and Asia. 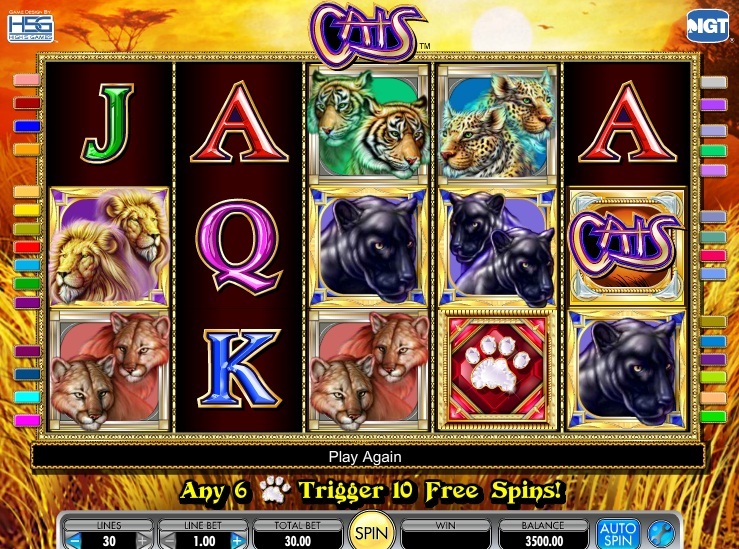 IGT, the maker of Cats slot has also developed an online version of the game. It is almost identical to the land-based version, with the same features and similar sounds. I found it difficult to spot any differences at all, which goes to show that IGT wanted to make sure they maintained every aspect of the original land-based version. As well the split symbols, the Cats slot has Wilds on all reels. These help make up more winning lines, which can really boost your wins in this game. It is a nice attribute of the game that there are so many Wilds on the reels. The free spins bonus round is triggered by seeing Scatters on reels 2, 3 and 4. These will release between 5-10 free spins depending on the number of paws in the Scatter symbols. This will re-trigger during the bonus round if the Scatters re-appear on these 3 middle reels at the same time. Cats is a very entertaining slot and one of my favorites, along with the casino-themed Vegas Baby. If you are not big on animals in your slots then you may prefer the Treasures of Troy online slot or the game show style 50,000 Pyramid.